Spokane 6, Everett 3: Austin O’Banion hit a two-run homer in the eighth inning to help the Indians (13-19) earn their first road win of the season, beating the North Division-leading AquaSox (17-15). Starter Jake Latz (2-1) allowed three runs (two earned) on three hits and a walk with five strikeouts. Emmanuel Clase struck out three and walked three in two hitless innings for the save (5). Jonah McReynolds went 2 for 5 with two RBIs while Jax Biggers went 1 for 2 with a run and three walks. Seattle Mariners prospect Josh Stowers hit a solo homer, his fifth, and went 2 for 4. Salem-Keizer 6, Eugene 2: Joey Bart went 2 for 4 with a double, two runs and two RBIs and the visiting Volcanoes (16-16) downed the Emeralds (11-21). Wander Franco went 3 for 4 with two doubles and drove in a run. Tri-City 10, Vancouver 4: Luis Asuncion went 2 for 5 with two runs and three RBIs and the Dust Devils (16-16) beat the visiting Canadians (15-17). Aledmar Burgos and Olivier Basabe drove in a pair apiece. 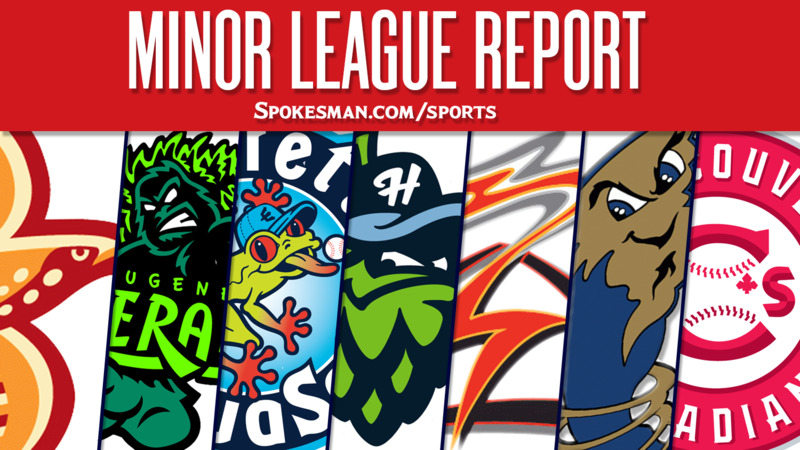 Hillsboro 6, Boise 5 (10): Jorge Perez hit a walk-off two-run single and the Hops (22-10) topped the Hawks (18-14). Perez went 2 for 5 on the night. Joey Rose hit a two-run homer with two down in the ninth to help force extra innings. Colorado Springs 11, Round Rock (AAA) 10: Domingo Santana homered twice and drive in four and the SkySox (53-41) beat the visiting Express (44-51). Jake Hager doubled and scored on a sacrifice fly in the ninth to walk it off. Richelson Pena was roughed up for seven runs on 10 hits and three walks over 3.1 innings. Hanser Alberto went 2 for 5 with three RBIs and Willie Calhoun went 2 for 5 with two runs. Corpus Christi 4, Frisco (AA) 3: Josh Rojas scored on an infield single by Eduardo de Oleo and the Hooks (61-33) beat the visiting RoughRiders (39-56) in walk-off fashion. Destin Hood drove in three for Frisco and Ariel Jurado gave up seven hits and two walks with five strikeouts over six innings. Down East (High-A): The Wood Ducks (44-52) were off on Tuesday. Charleston 5, Hickory (Low-A) 2: Deivi Garcia struck out seven over 4.1 innings and the RiverDogs (46-46) defeated the Crawdads (44-49). Noah Bremer gave up five runs on eight hits and three walks over six innings. Published: July 18, 2018, 5:55 a.m.